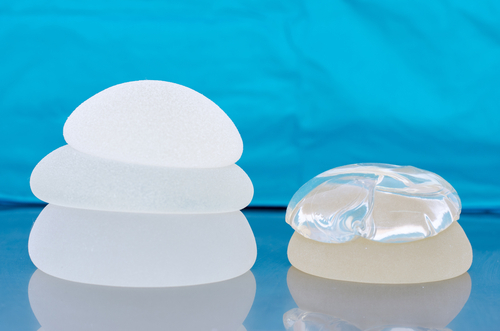 Silicone versus saline breast implants is one of the primary questions when considering a The A or B cup woman generally does not have a large volume of their own breast tissue to disguise an implant, and I will recommend silicone. The silicone implant in these women looks and feels more natural. The silicone implant also does a great job of providing not just added volume but also added roundness and shape to the breast. A saline implant would have more chance of visible rippling or, if overfilled, would feel more firm in the A or B cup woman. Therefore, a silicone implant is superior. In the C or D cup women, a saline implant is a good choice. The saline implants themselves are cheaper by cost and offer a result for this category of woman that is equivalent to silicone. The C or D cup woman has plenty of native breast tissue to disguise the saline implant, and the feel of the breast is predominantly their own tissue. The saline implant serves more in this situation to provide added volume to the breast and is not affecting the breast shape to a great degree. The discussion of which implant to use is an important one. Both the surgeon and the patient must understand the patient’s goals and objectives and choose an implant that provides the result the patient desires. The good news is that while I have my recommendations I feel provide the best outcomes, both saline and silicone implants are safe and reliable and provide excellent cosmetic results. If you are considering a breast augmentation, contact Advanced Cosmetic Surgery to schedule a consultation. Please call 913-341-2188 or fill out our online contact form today.